I have resumed repairing Willits and other wooden canoes on a limited basis. I'd be happy to examine your canoe with you to determine if it will be cost-effective for me to do this work for you. Unfortunately, some canoes are just too far gone to be economically restored! Even though Earl and Floyd Willits made their canoes to last for generations, years of use takes its toll on even the most lovingly cared-for canoe. They eventually need some work to bring them back to their original splendor. I am expert in the repair of Willits Brothers canoes, a unique "double planked" canoe built in Tacoma, Washington until the mid-1960's and now highly prized by knowledgeable canoe enthusiasts. The method of construction used in these canoes requires special techniques to restore correctly. 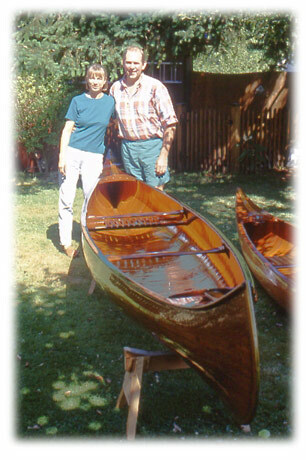 I'm not aware of any other builder with more experience restoring Willits Brothers canoes. If you have a Willits Brothers canoe that needs repair or restoration see my page on Willits Brothers canoes and then give me a call. 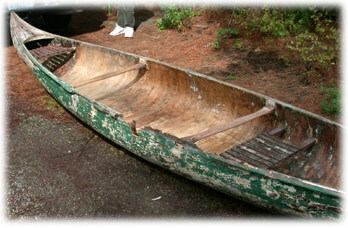 I also am expert in restoring all kinds of wood and canvas canoes and boats. The extent of repair/restoration needed will determine how long the work will take. Major repairs may take up to 3 months after I begin reconstruction, minor ones 1-2 months. Prices: Since each canoe requires a unique process to repair or restore, there is no standard cost for this work. Estimates can be given upon examination of your boat in my shop. Call to set up an appointment. Terms: A $50 deposit is required to reserve a place on my schedule after I examine your canoe and provide an estimate of the cost of repairs. In most cases I cannot store your boat while awaiting repair but will contact you for delivery to my shop when needed. Deposit refunded in full if cancelled prior to the start of repair; otherwise, nonrefundable. Once reconstruction has begun please allow up to 3 months for completion. The Wooden Canoe Heritage Association hosts my website and I'm a proud member. If you aren't already a member, you should be. Click here.